The hubby and I love watching movies. It used to be in the theatre, but after becoming parents, the theatre visits came less and less often. But we would still watch movies at home whenever we could. This summer, we started a movie night with the kids. Since they are still young, we made it a monthly movie night. It is something they get very excited about. We make pizza, popcorn, get comfortable in front of the TV and then pick a movie from our movie jar. With so many movies out there, sometimes it’s really hard to pick! Here are 10 of our favourite family movie night suggestions that we loved or want to watch. Aristocats – We recently read the book and really enjoyed it, so the kids were really excited to find out that the movie is now on Netflix! The Princess and the Frog – Kyah enjoys her princess books, so the Princess and the Frog seems like a great choice for movie night. Meet the Robinsons – We’ve heard a lot of good things about this one so it’s on the list! Smurfs – I loved Smurfs growing up so we had to watch it with the kids too! How to Train Your Dragon – I think HTTYD will become a classic. The kids have watched it a couple times and just love it! The Croods – We loved this movie that was about a family trying to connect, set back in the stone age. Honey I Shrunk the Kids – Another movie I loved when I was a kid and I’m sure the kids will enjoy it! Bee Movie – This was a fun and charming movie about what a bee’s life is really like. The Rescuers – A classic from 1977, this is on our must watch, because I want to see it too! Turbo – The whole family loved this movie about a snail with a dream. 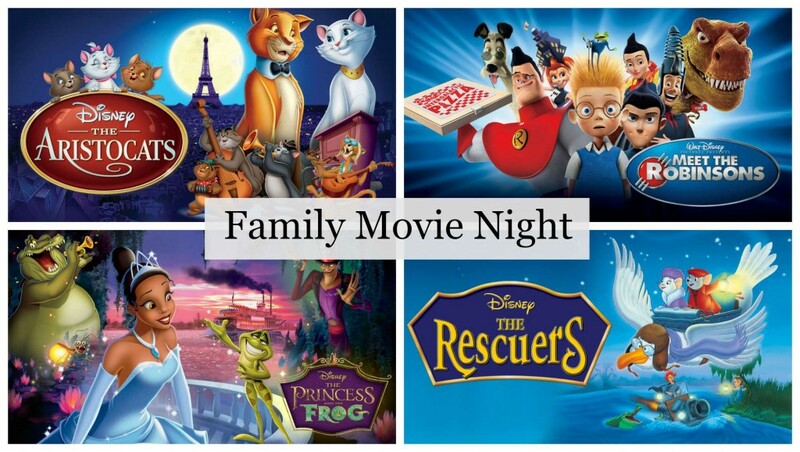 What’s been your family’s favourite movie for movie night? We saw Wreck it Ralph for our last movie night and totally loved it 🙂 I’ll be reviewing your list at our next movie night! I like all these I’ve seen, but it’s been many years since I had any little ones to occupy on family night. Back when my children were little, the watched The Flower Pot Men on BBC tv, from Australia. We had no movies at home. Lately the kids have been really into Avengers movies which makes my husband really happy! Me, too, actually! Although I love a good Disney cartoon-y movie, I’m really enjoying the slightly more grownup stuff! I use to watch the Smurfs too!!! I miss old cartoons, they were the best.